(AP) ROME - An eight-ton gilded bronze door so splendid Michelangelo dubbed it the "Door of Paradise" will be unveiled to the public again after 27 years of restoration work. But Lorenzo Ghiberti's 15th-century door  which bears scenes from the Old Testament  won't be going back in its place on the baptistery of Florence's duomo, or cathedral. Instead, starting on Sept. 8, it will go on display in a case at a Florence museum, the Museo dell'Opera di Santa Maria del Fiore, to preserve it from renewed damage. Culture Minister Lorenzo Ornaghi announced the destiny of the baptistery's east door at a news conference in Rome on Thursday. 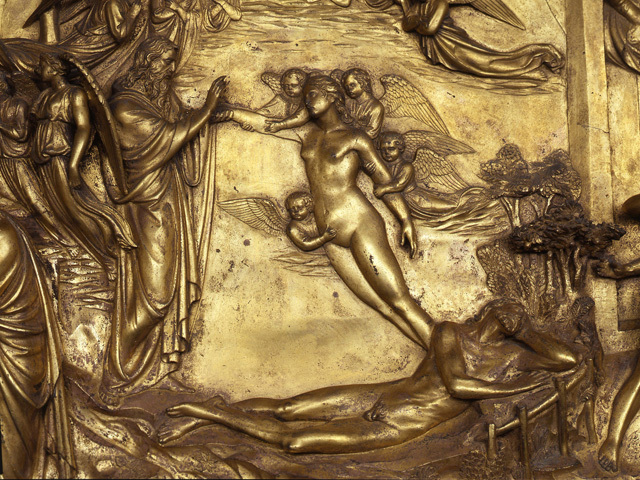 During World War II, the "Door of Paradise" was temporarily removed from the baptistery to spare it from damage, only to see it battered by the raging, muddy waters of the Arno River during the 1966 flood that devastated much of Florence. Six of its 10 panels were ripped away by the force of the flood. The panels were re-attached, only to be ravaged over time by pollution. A copy was put in its place in 1990 after the original was sent off for restoration. Officials told reporters that the baptistery's south door, by sculptor Andrea Pisano, and its north door, also by Ghiberti, are being restored and will also end up in the museum. Ghiberti's masterpiece is one of several Italian art treasures to end up in a museum following restoration. The four gilded bronze horses on the facade of St. Mark's Basilica in Venice were moved inside St. Mark's museum in 1982 and replaced outside by copies. In the heart of Rome, the 1,800-year-old bronze equestrian statue of Emperor Marcus Aurelius, badly eroded by pollution, was removed from its outdoor perch in 1981 atop the Capitoline Hill for restoration and is now a star of the Capitoline Museums. A replica of the statue adorns the square outside the museum. "When you take an artwork from its original context, it is always a defeat," Cristina Acidini, a Florence museums official, told The Associated Press. However, she added, it is a "necessary process to save the original."